For some, a modern dining experience is just as important as knowing where the beautifully presented meal has come from. 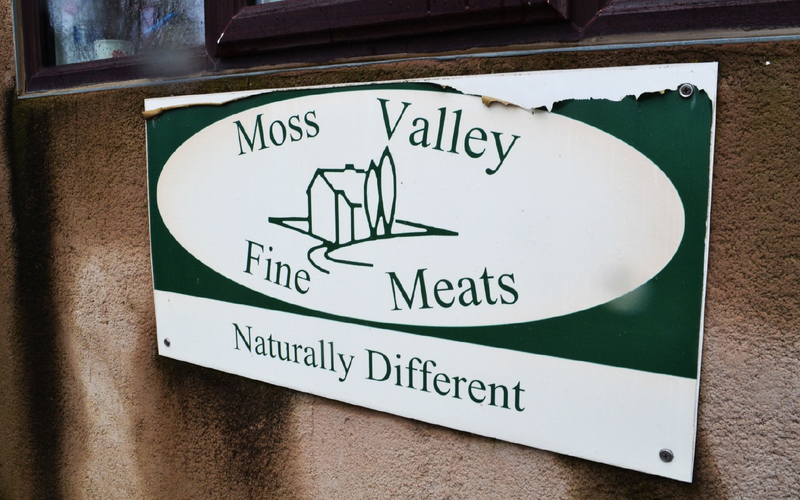 The purveyors of that farm to fork approach in Sheffield are Stephen and Karen Thompson – owners of the award-winning Moss Valley Fine Meats pork farm. 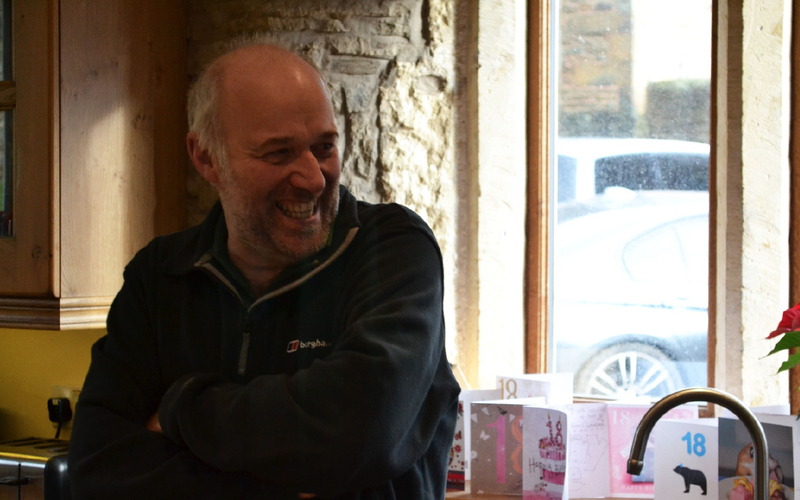 As we knock on the door of the beautifully situated Povey Farm, Stephen and his wife Karen welcome us to their kitchen and we start chatting over a cup of tea, naturally with a splash of Sheffield’s own Our Cow Molly milk. For us, it’s warming refreshment on a rather chilly day. For them – a short break in another full day of farm work. “Our land is 240 acres, 200 of that arable and we manage it all ourselves – working with the pigs all week, the harvesting season on top of that can get very busy,” explains Stephen, when we step outside to admire the vast fields of wheat and barley, of which they use 25 tons of each week. Stephen is the fourth generation of farmers to own Povey Farm, but since 1890 a lot has changed. “My dad died when I was 13, so my mum ran the farm for 10 years. I went off to study Agriculture in Nottingham, where I met Karen,” he says. 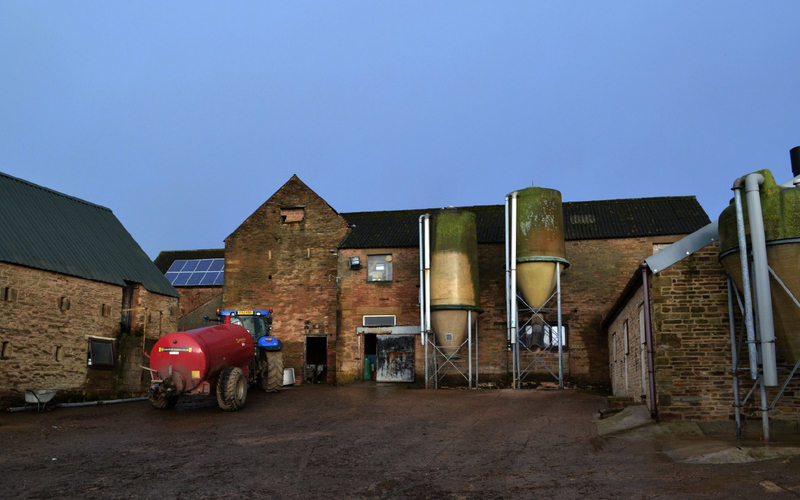 “When we came back, the buildings were in a bit of a disarray, there were no separate pens or fittings.” A 50-pig unit was also not enough to keep two families, so the Thompsons had to expand. The farm now produces a 100 Duroc pigs a week, has an onsite butchery and supplies 50 eateries, shops and delis in the Sheffield area with a variety of sausages, bacon and whatever cuts the customers desire. 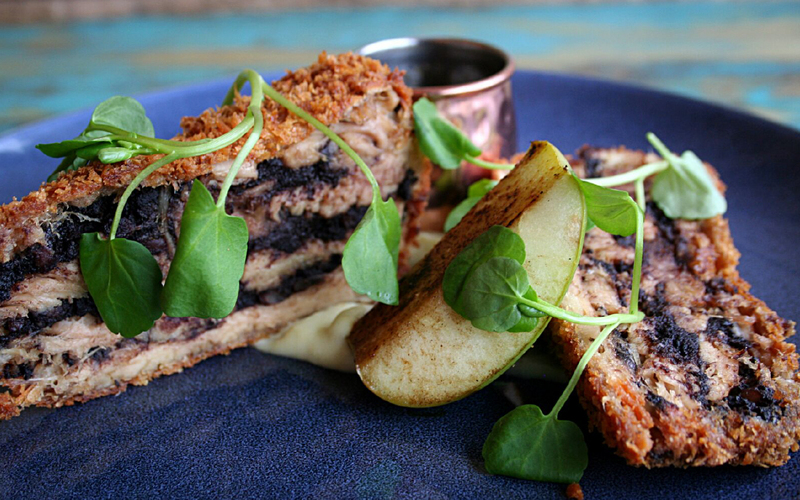 The best proof of Moss Valley pork versatility could be our Butcher & Catch menu, where it features heavily: there’s a paprika, honey and Hendo’s belly pork encased in a yorkie pud hug to start with, a skewered diced pork shoulder or the beautifully layered belly pork and black pudding cake for your main course, and a sprinkle of bacon here and there, which we always find some use for. 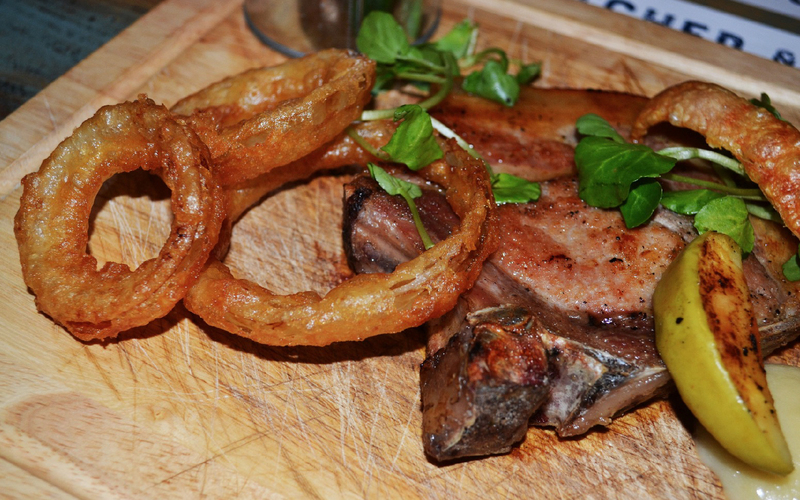 “With our produce we want to give people a good experience with pork, which they’re often disappointed by,” says Karen, and judging by the bestselling quality of our succulent, buttery Moss Valley Pork Chop, great quality pork with an excellent reputation really speaks for itself. Once we’re equipped in visitors’ wellies to ensure the high biosecurity of the farm remains intact, we tour all the buildings and pens, where the 2,000 pigs are bred, born and reared – on high quality feeds and antibiotic-free. “UK average usage of antibiotics is 100 mg/kg, we’re at 1,6mg. We cleaned the herds out in 2000, de-stocked and re-stocked with high health pigs,” says Stephen proudly. Looking at the conditions the pigs are kept in, indoors and far from the cruelty of factory farms, it becomes clear why the finished product is renowned and recognised among the locals as simply… better. From choosing the healthiest looking sows, to making sure there is no cross-breeding or additional stress put on the animals, there’s provenance, diligence and care in everything Stephen does. The company’s motto ‘naturally different’ couldn’t be more accurate. Now that the foot-and-mouth crisis is behind them, the plans of getting the pork that boasts the prestigious Made in Sheffield mark ‘out there’ are closer than ever. 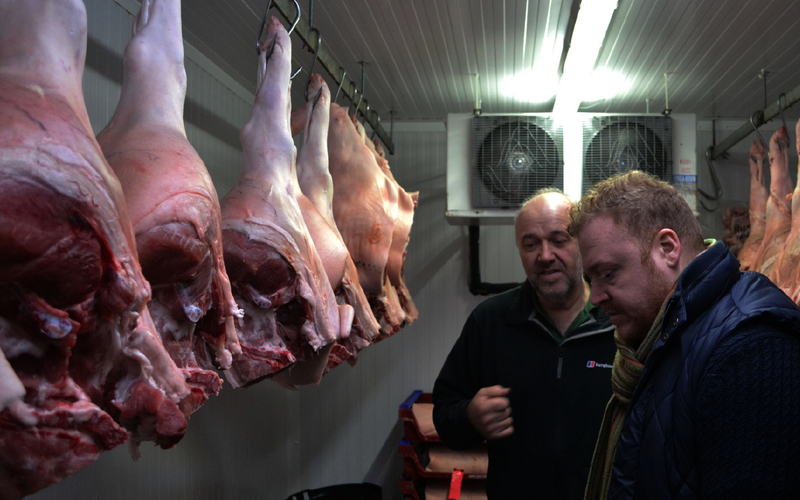 “The radius of supply is fairly local at the moment, but we just got the permission to triple the size of our butchery, which would make it possible for us to look into exports into London,” says Stephen, as we discuss future expansion. A fan of using local produce himself however, he also highlights the importance of widening the customer base throughout Sheffield’s independent businesses. “We have chef’s coming to us now, proving that what we do is pork done right,” he adds, smiling. Anyone partnering with Stephen can expect a professional, yet friendly relationship. We will surely be growing ours stronger, as we develop more fantastic pork dishes in the future. 1. Place the pork belly in a deep roasting tray. Scatter with cinnamon, star anise and black peppercorns. Pour over the oil until the belly is submerged and then cover with tin foil. Place inside an oven and cook on 130°C for 5-6 hours or until the meat is very tender. Once cooked, allow to cool slightly, then carefully remove the pork belly from the oil. Remove the skin and pull apart the meat with two forks until it’s shredded. 2. For the yorkie puds, preheat the oven to 200°C, and using the same cup measure out the flour, eggs and milk. Whisk together the ingredients until smooth and leave to rest for 10 minutes. Place a small amount of oil or lard into a yorkie pud tray and place in the oven to heat up. Carefully remove from the oven and half fill each hole with batter. Cook for 13 minutes or until crispy and risen. 3. For the glaze, heat the honey, Hendo’s and paprika together in a pan and reduce by a quarter. Cool and store in a squeezy bottle. 4. To assemble, warm one of the yorkies through the oven and heat some of the pork belly in a pan with the glaze. Fill the yorkie with the pork mix and place on the plate, drizzle with some of the glaze and garnish with watercress. 1. Surround a soft boiled egg with meat. 2. Flour, egg and bread the meat ball. 3. Fry the scotch egg in a meat fryer at 170°C for 10 minutes. 4. Cut the egg in half, garnish with watercress and serve with chutney on the side.